I’m calling this a “Frankenrecipe” for two reasons. 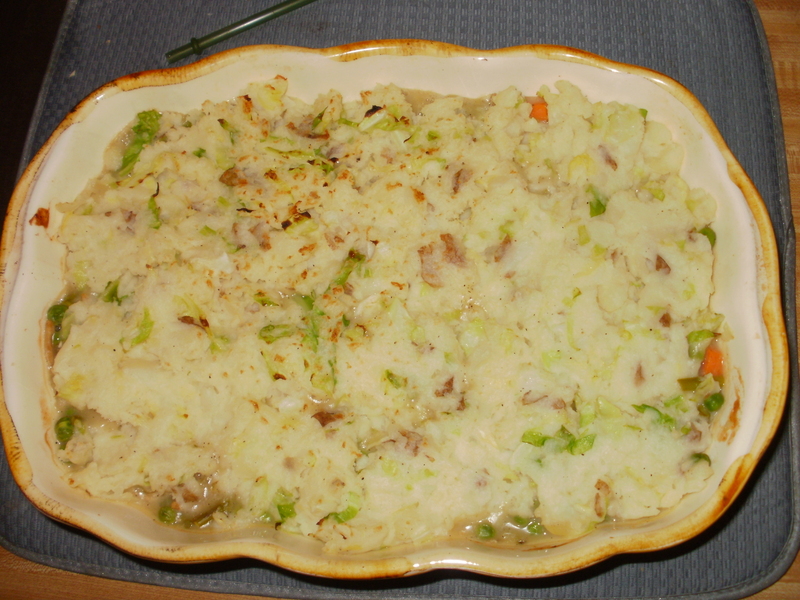 One, it ended up being a combination of colcannon (an Irish dish; usually kale or cabbage in mashed potatoes) and Shepard’s pie. Two, I pretty much just tossed in all the odds and ends in the refrigerator, and if I’d had different vegetables on hand, I could still have made it. Plus, it’s fun to say “Frankenrecipe”. Try it! I’m sorry to say that I don’t have good measurements for this Frankenrecipe. I really just made it up as I went along. Here’s the deal: It’s Friday. I came home from work tired and went right into pajamas. I thought about ordering a pizza, but I still have so much good food from my last CSA box that I couldn’t bear to not use it! Plus, since I quit drinking pop and started tracking calories about 2 weeks ago, I have lost almost 7 pounds! I can’t ruin that with a pizza just because I’m lazy. 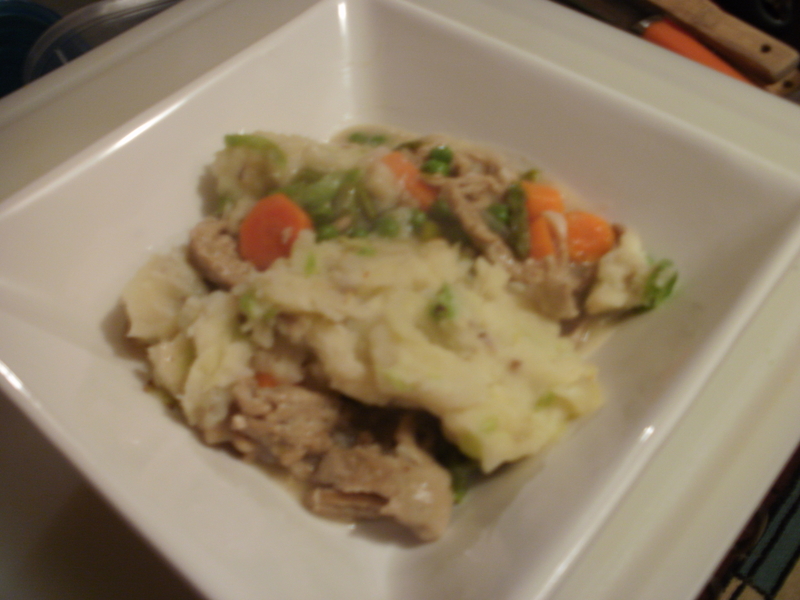 I’ve been thinking about making colcannon since I first started getting cabbage in my CSA boxes. If I’m going to make mashed potatoes, why not a Shepard’s pie? What better way to use all this stuff? 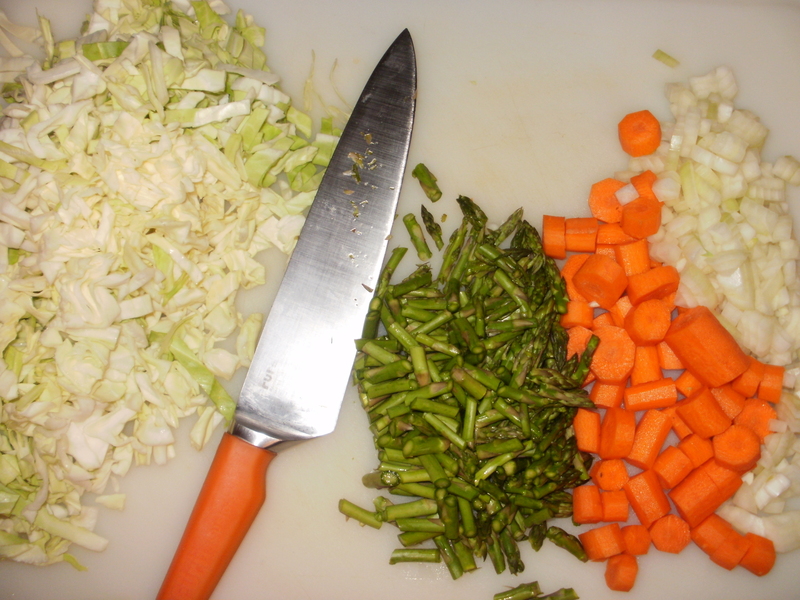 And with no real plan, I just started chopping. 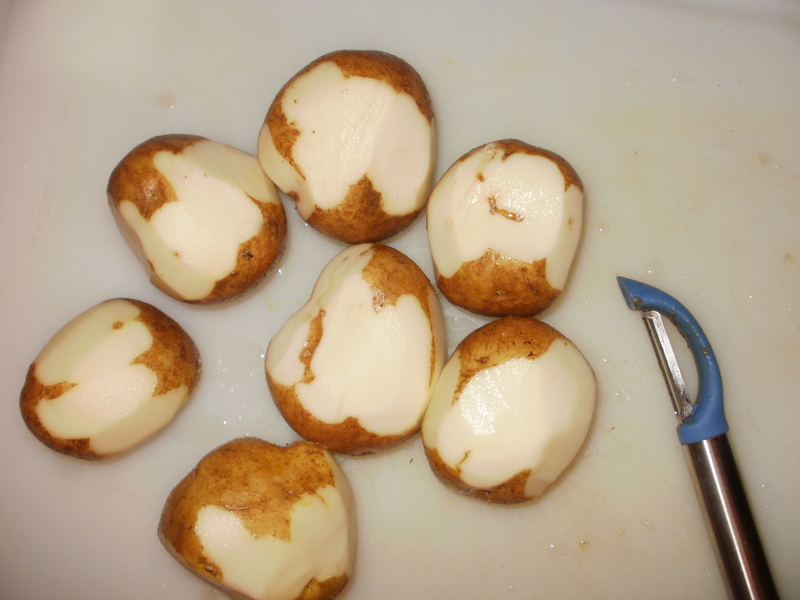 These were bigger potatoes, so I quartered them before throwing them in a pot, covering them with water and putting it on the heat. 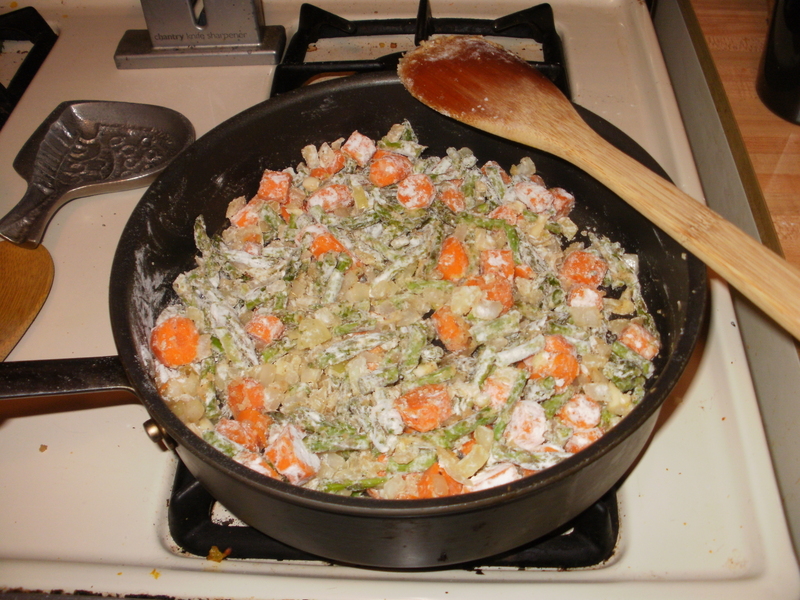 While the potatoes were cooking, I chopped the carrots, onions, asparagus, cabbage and garlic (about 4 cloves). I browned the ground turkey with a little bit of olive oil, salt, pepper, sage and some nutmeg (I don’t know why I went for nutmeg, it just seemed right), then removed it from the pan. In the same pan, I sautéed the carrots, onions and garlic (with a little salt and pepper) until they started to get soft. Then I added the asparagus and a couple big spoonfuls of flour so it could cook with the veggies (and eventually thicken the sauce). 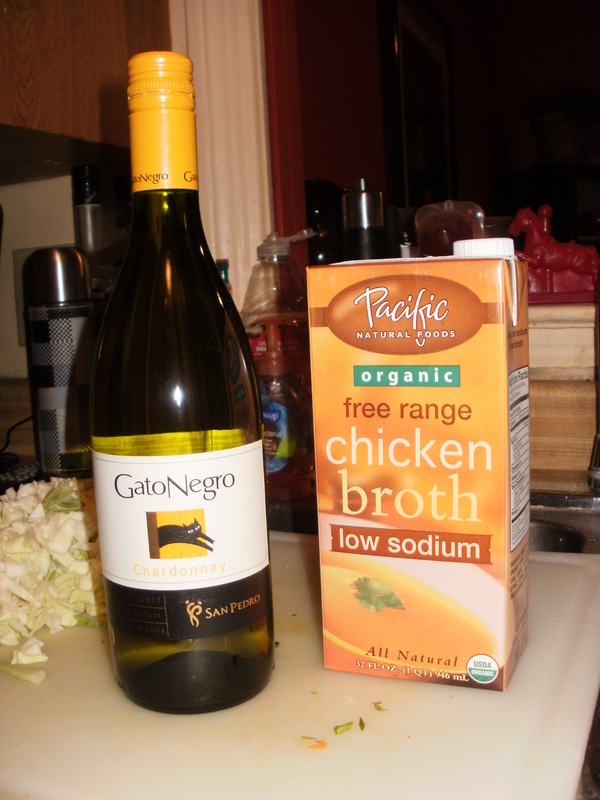 After that cooked together for a few minutes, I added most of a box of chicken broth and a couple of glugs of (cheap) white wine. It’s also rumored that I may have had a glass (or two) of wine, but you can’t prove it and I’m not admitting anything. 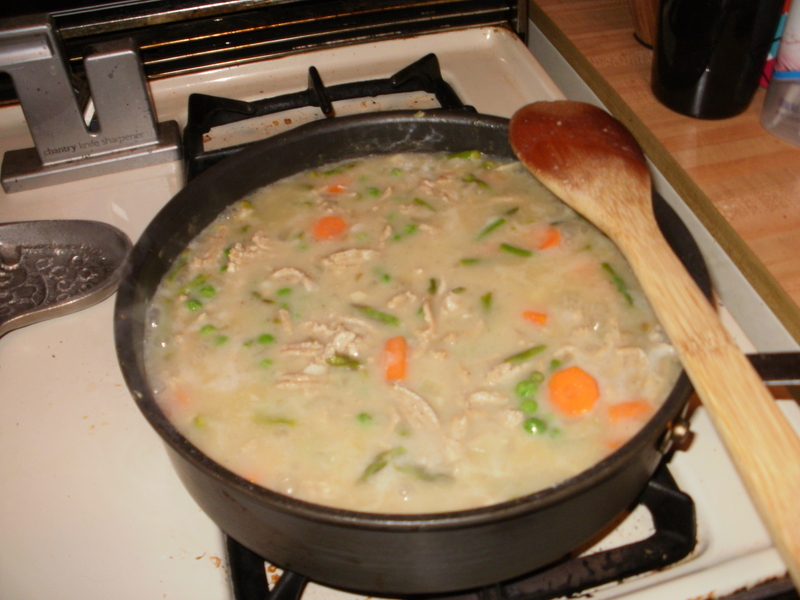 Once the liquid was added to the veggies, I turned the heat on high to bring it up to a boil. Back to the potatoes: Once the potatoes got soft enough to mash, I dumped them into a colander. 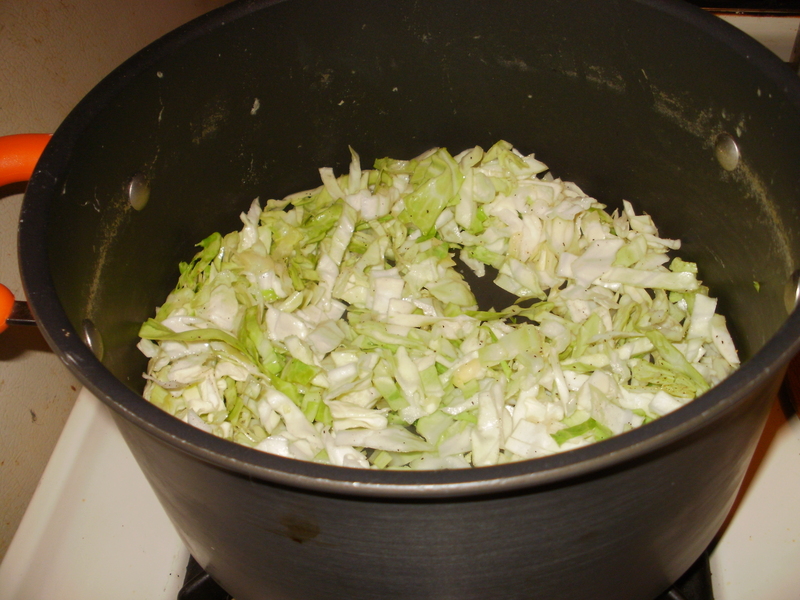 I put the potato pot back on the oven over medium heat, added a little olive oil and tossed in the cabbage to cook. Oh yeah, I added a bit of salt and pepper to the cabbage. In case you were wondering, cabbage turns a really pretty bright green when you saute it with a little oil. Awesome! It only took the cabbage a couple of minutes to get nice and soft. 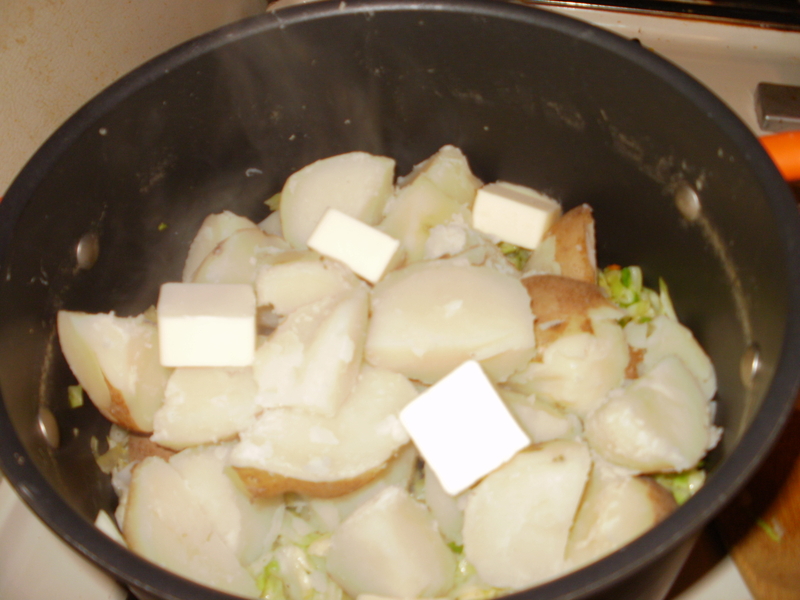 I turned off the heat, added the potatoes back to the pot and tossed in about 2/3 a stick of butter (it’s what was in the butter dish). 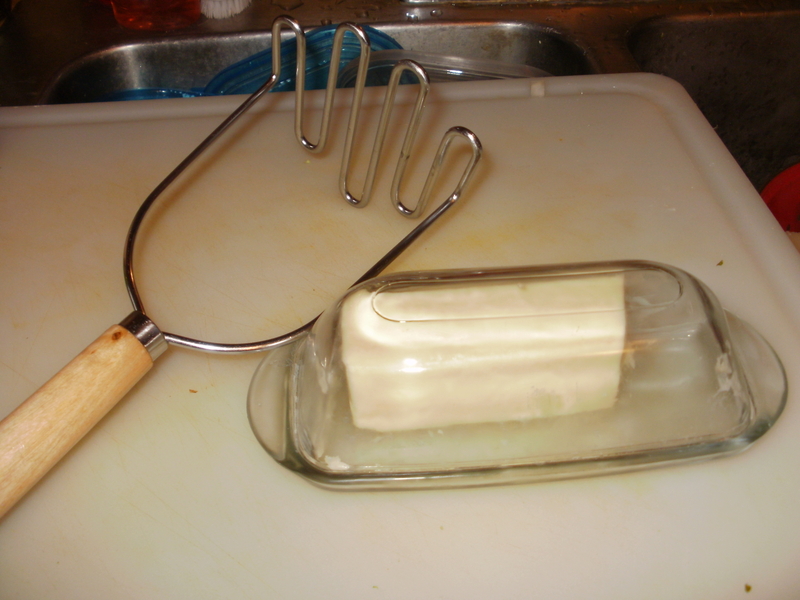 Then I mashed, with my trusty masher (featured in the picture below). Like I said, I like my mashed potatoes to have a good texture. I very rarely add milk when I’m mashing, just butter. But that’s just my preference – you do what you like! Back to the veggie concoction: When it came to a boil, I added the ground turkey back in, and added a dollop of frozen peas (I just poured from the bag until I thought there were enough peas. I let it boil for a few minutes to reduce the sauce. When I thought the sauce was thick enough, I poured this into a casserole dish and topped it with the mashed cabbage-and-potatoes. Everything was hot, so I just put the whole thing under the broiler for a couple of minutes to brown the top of the potatoes a bit. And there it is. Now I have dinner, leftovers and a clean refrigerator! What could be better than that? This entry was posted in General on November 16, 2012 by Melissa. And, congrats on the seven pounds! Good for you!! Me too! I want to try making it with kale as well – I think that would be pretty with the dark green in the potatoes. It was pretty tasty. And good for leftovers!